We have so much to catch you up on and also encourage you to visit our Facebook and Twitter where we regularly share press clips, updates and invites. At 6:00pm in Providence TONIGHT, we have an event where we are making valentine’s to show some love to the co-sponsors of the Reproductive Health Care Act. We are doing another event tomorrow at 6:00pm on Valentine’s Day in Narrangansett. JOIN US to eat some chocolate and hang with fellow activists! Click here for more information. Also, we just scheduled our first BIG canvass this Saturday. Put on your layers and join us. We need to make it clear that we are not going anywhere and we want this bill to pass THIS YEAR! Learn more and BE THERE – 10:00am to 1:00pm in North Kingstown. So what else? We held a tele town hall to clear up confusion and misinformation and provide suggestions on how folks can get involved. We were thrilled to have a strong group of folks together on a Sunday night (and during the Grammy’s. 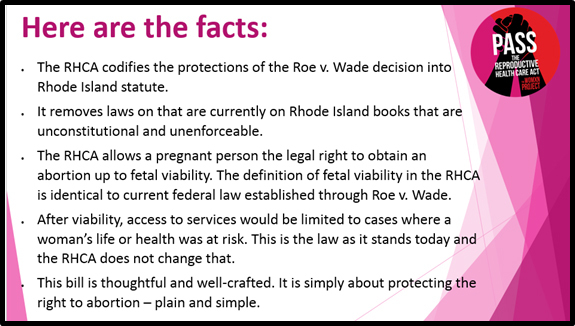 You can check out the convo at #Repro4RI (along with other resources). There are a lot of inflammatory claims being made about the bill. You may have heard people say that the RHCA and other bills permit a woman to seek an abortion at any stage in pregnancy for any reason. This is simply not true and they know it. There has been a ton of debate about polls. Basically, our opponents have questioned the ABC6/Providence Journal poll that found that 71% of Rhode Islanders want our General Assembly to take action and protect Roe and the right to abortion. Then, they turned around and released what we guess you could call a poll – though it really did not ask about the right to abortion. Instead, it pushed more of the harmful rhetoric and lies about the RHCA and the provision of abortion care. You can check it all out on our Facebook and also read The Womxn Project’s statement. Listen, we know that if Roe is overturned, it would cause great harm to the women in our state. We are done waiting. The time is now. That means that we need you to be in this with us. You can be part of our postcarding program or join us for a postcard party and BEER TASTING. Yes, you read that right. Don’t miss out on the fun on Saturday, February 23rd from 3:00-6:00pm in Providence! Together, we will not only do all we can to get this bill passed and protect the right to abortion, but also continue to develop a strong movement for real, lasting and positive change in Rhode Island. We need you to be in with us!